The trip we took this month was quite a dream come true. 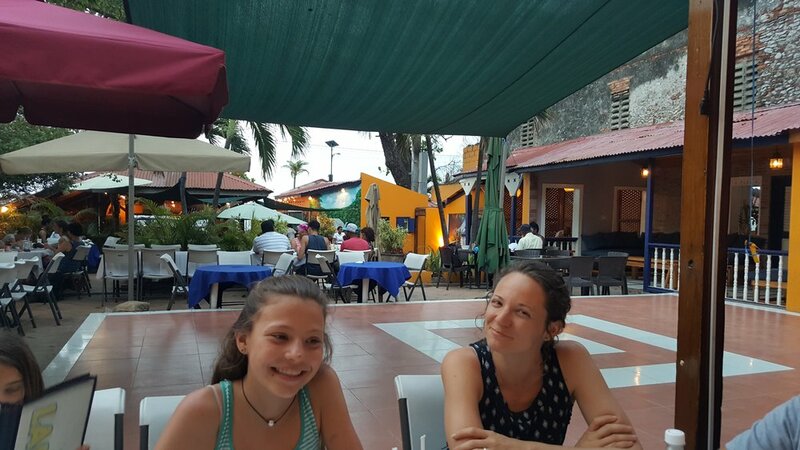 As a young person, I had the opportunity to travel and experience other cultures. Those experiences in Mexico, the Philippines, Korea and Indonesia made an impact on me. The up-close experience of being the outsider in a foreign land, feeling the shock to the senses of new sights, smells and environment all leave a person changed. During my own travel journeys, I was caught up in the tension between personal discomfort and excited awe over the beauty of the people and place I was in. Would my own children feel this way? From the time my children were born, I had hoped to find out. Part of my decision to homeschool in those early years was for the freedom to travel. "Perhaps we could even spend part of every year in another country!" I dreamed. I desperately wanted them to know that the 'American way' of life is not the way the rest of the world lives. I wanted them to be touched by the injustice of poverty, to be changed by the beauty of simple living and to gain a desire to make a difference through giving of themselves. The reality of my life journey turned out differently than I had planned... as it so often does. But the financial limitations that kept us from becoming world travelers, also happened to lead me right into my passion. Becoming an Urban Homesteader was not on my mind when I dug up the front lawn in 2011. We had struggled with health issues and couldn't afford expensive organic produce in the stores. I was hoping to make an impact on our health and our budget. I ended up discovering so much more than that. 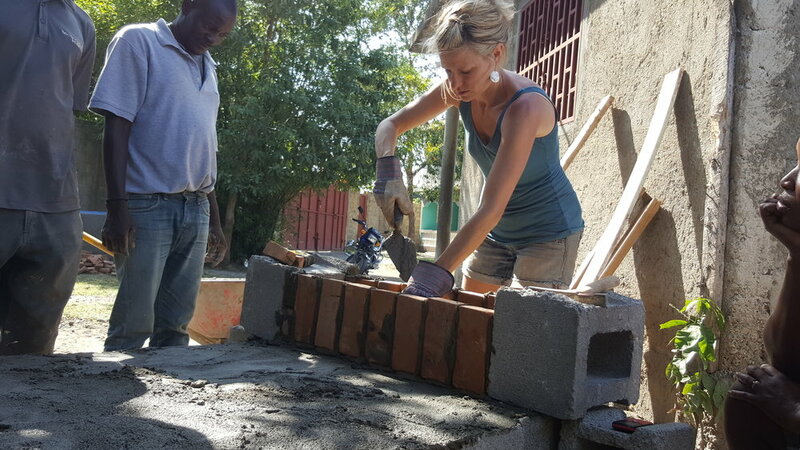 Being asked to come help my cousin with their garden project in 2013, right as Second Mile Haiti was about to open their doors for the first time, was a thrill. I have served on SMH's board of directors since then, and have watched this organization save and change lives, doing my best to support their efforts in sustainability from afar. It has been a joy to share my passion for sustainable food - a gift born out of my own struggle, with others. As far as my dreams of family travel were concerned, not much had changed this past year, in terms of making it a reality. Two out of my four girls were now in full time school, limiting our freedom to go whenever we wanted. I had resigned myself to reading as many books about other cultures with our family as possible, taking tours of Pakistan through Malala's eyes, watching eye opening Documentaries and sharing up to date current events and issues in the news. Though I now had a personal connection to Haiti, calculating the cost to take all of us down there always left me low. I'd hear the ugly voice of scarcity whispering "Don't even let yourself dream it. You can't afford it, and it will never happen!" You'd think by now I would have learned to ignore the nagging voice of scarcity. Tending the soil and learning how to grow food has taught me again and again that although I often see limitations, ABUNDANCE is the true nature of this beautiful universe. I didn't realize when I named my local CSA Plenty Heirloom Farms, that I was being given a daily mantra, a reminder that there is more than enough waiting for me in each moment - there is plenty today. And plenty just around the corner. The earth shouts it to me every season that I get to interact with plants and animals, seed and soil. Generosity overflows. 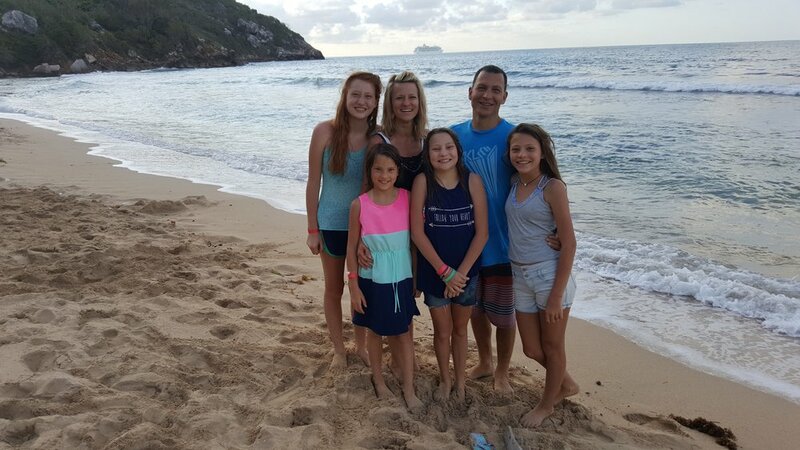 Though we didn't see a way to raise the funds on our own to take this trip, we did know that our desire to take our family to Haiti hadn't ceased. Eventually, we got the courage to put scarcity in the back seat, and trust that plenty would be provided when the time was right. We organized a backyard gathering, doing what we loved - hosting a meal cooked from our wood fired oven, in the hopes of raising some money to get started. Just as I'm surprised by the abundance of new perennial seedlings that pop up in my yard each spring, the miracle of what is hidden within one tiny seed, or the prolific earthworms reproducing under my leaf pile... our community blew us away by their generosity. In ways that I couldn't have imagined - our community jumped in to help. Many of you were those who found joy in helping us go. I hope you enjoy these pictures of our trip, and that you share in our excitement about the work being done in Haiti. These beautiful people deserve the chance to live healthy lives and raise their families well. It is a privilege to partner with my cousins as they work so hard to change lives every day. It was a joy to share our time with them! Our flight left Denver at midnight, arrived in Florida at 6am. 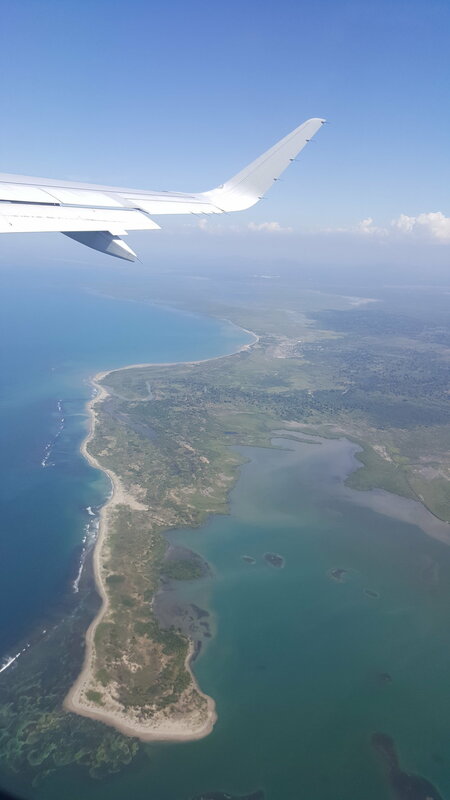 After a layover, we flew out of Florida at noon and arrived in Haiti at 2pm. In the car after Amy picked us up. A whole new world outside the windows. After landing around 2, we made it to the house, unpacked and took a look around. We had quite a bit of luggage with us, since we'd packed some internet routers, medical supplies, tools for cement mixing and welding, and even flour and sourdough starter! We met the dogs (Gia's favorite!) and settled in for an early dinner made by Amy, and went to bed under mosquito nets. We were so happy to finally be there. All of our luggage made it safely! After her first good night's sleep under the mosquito net. After a good night's sleep, we got up early Friday morning and drove out to the land. It's about a 15 minute drive on a bumpy road, through a few villages to get to Second Mile's land. Just 1/4 mile down the road is the new Strong Start Maternity Center property. Amy and Jenn gave us the tour. I had a blast saying hello to old friends from my first trip at Second Mile, and was thrilled to see the progress on the gardens, the new yogurt building, the growth with all of the new animals, and get an idea of where we would be building the griddles. 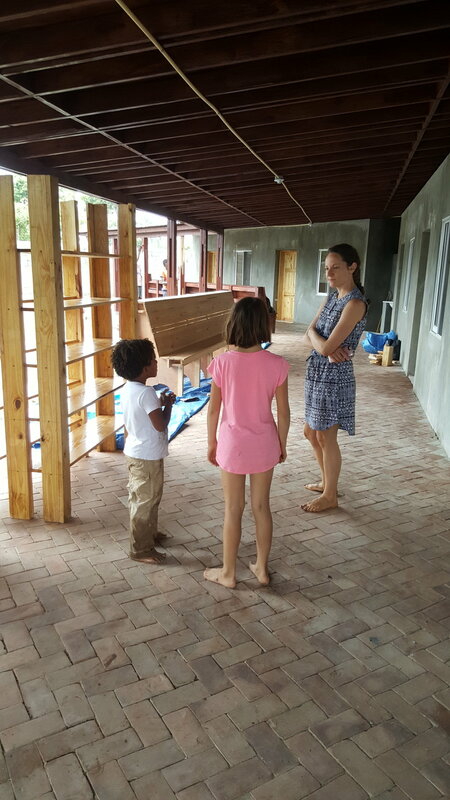 Jenn showed Jeremiah the carpentry projects she needed him to accomplish at Strong Start. Amy and Jenn - a powerhouse team! Greeting Wesley, who now manages the gardens. So proud of all he has accomplished in 5 years. Chicken tractors - raising their own meat birds. So happy to see this thriving chaya plant, which I brought with me as a 4 inch start, 5 years ago. After the tour, we jumped right in. 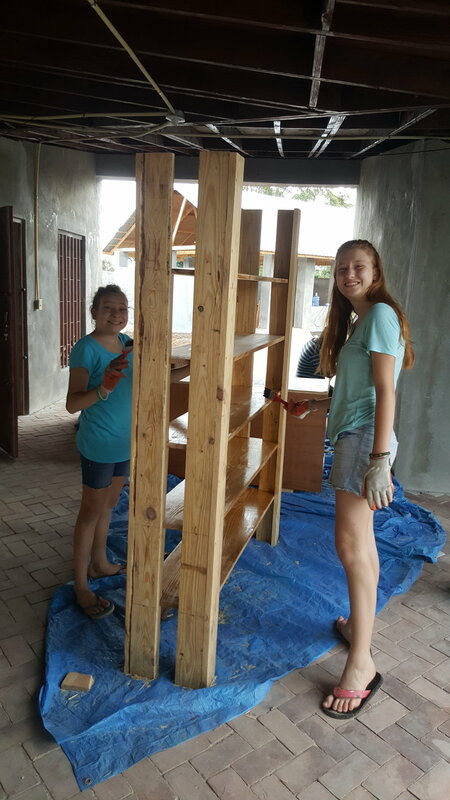 The girls got started painting rooms at Strong Start, and we started laying out the griddle on the pad that they had poured. We were proud of the girls, they worked hard and got a lot done! mixing cement... lots and lots of this! A pretty special reward, along with lunch every day. 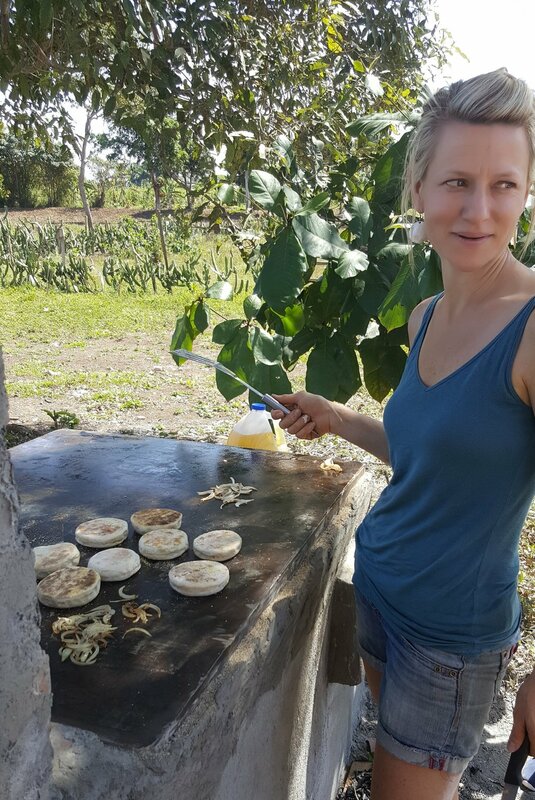 We enjoyed our Haitian lunches, cooked for us each work day out at the land. Some paint DID end up on the walls, too! It took us a while to figure out how to build this griddle, since we had to use the materials we could find down there. We were thrilled to have found a 1/2" thick steel plate which was a great size. We didn't have to cut it, but did need to figure out how to heat this one, since it was 35" x 43" - quite a bit larger than ours at home. We decided to create a dual fire, dual chamber system - with the goal of heating the entire plate effectively. The tricky part was figuring out how to seal the gap where the plate meets the brick/cement. As metal expands when it's heated, we knew we'd need some way to insulate it. We couldn't get fiberglass insulation down there, so we decided to set the metal lip into a bed of sand. We created a lip all the way around the edge to hold the sand. We were nervous that when we lit one fire on one side, it might draft out of the other firebox. There was no way to know for sure if it would work... we had to try! We built this griddle with two fireboxes, to heat the larger sized steel plate. The beautiful view out at Strong start, just behind the griddle. The women cooked our lunches out here each day. Our dual chamber rocket stove design... we were hoping it would work! Progress after only 2 full days of work! 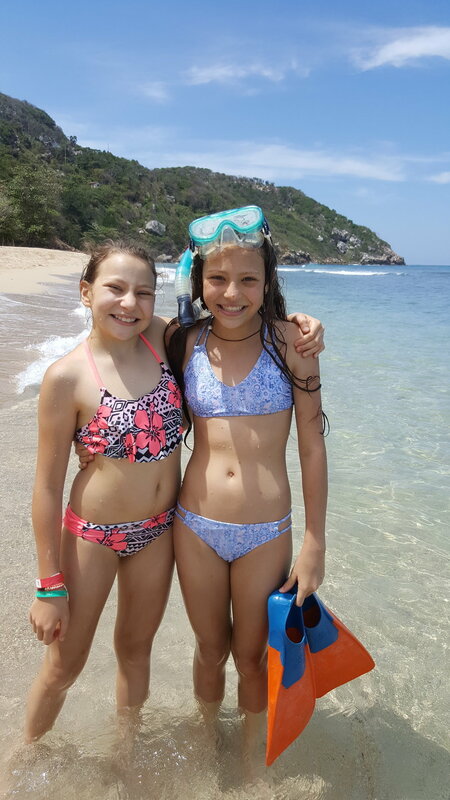 On Sunday, we took a day off and Amy drove us up and over the mountain to an amazing beach called Labadee - where we got on a small boat and motored to a beautiful cove called Paradee. It was a paradise for sure! The water color was amazing. Jeremiah couldn't wait, and decided to jump in and swim to shore once we got close. We were amazed at the beauty and all of the colors! This is a popular cruise ship stop. Amy and Gia, sunscreened up and ready to enjoy the day. OK, time to jump in! Once there, all of the spear fisherman had their fresh catch ready for us to choose from. Amy chose which items we wanted, and then they took them off to cook them up for lunch. Choosing what to eat for lunch! Here is what Amy purchased. I was in shock with how much she got for us, but... we ate it all! Lunch is ready! We used a stick and a rock to crack open the crab legs and lobster tails. They used a very spicy Haitian sauce on the conch which was tasty. It was very simple - pure seafood, no frills! Our favorites were the eel and crab. Thank you for a GREAT day, Amy! These two enjoyed diving for shells. 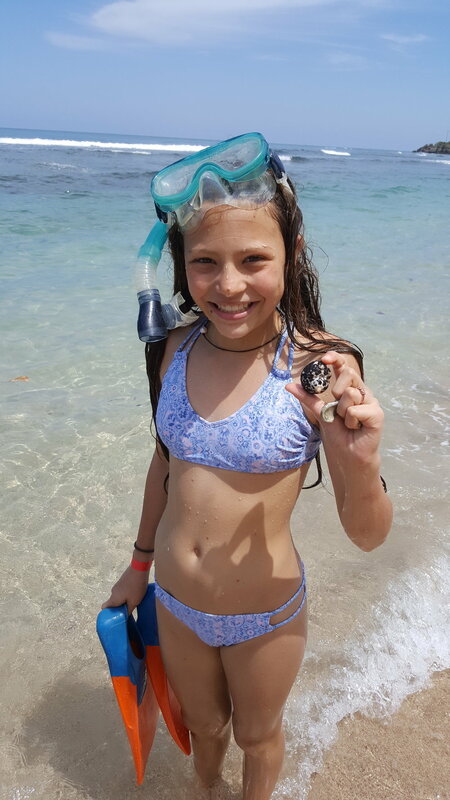 It was Bella's first time snorkeling. On the way home from the beach, we stopped in town and went to buy some things at the market. The pictures don't really show what this experience is like. It was overwhelming to the senses, even though a Sunday is very quiet, with maybe just a fraction of the people selling. I'm glad they got to see this up close. It was so great to have Amy as our guide. This woman amazes me. Both her and Jenn made us feel safe and comfortable everywhere we went. We had some laundry to do as well, so we picked up a bar of soap at the market and got to work at home. After our relaxing beach day of fun, I was eager to get back to the land and get our griddle finished! Nervous about whether or not our experimental design would work, we got right to work. We had a fire lit by lunch time, and the griddle was heating up! We didn't have anything to cook on it, but we saw where the smoke leaks were and tweaked our design a bit. We could tell we needed to make our chimneys taller. It was an exciting moment to light the first fire! 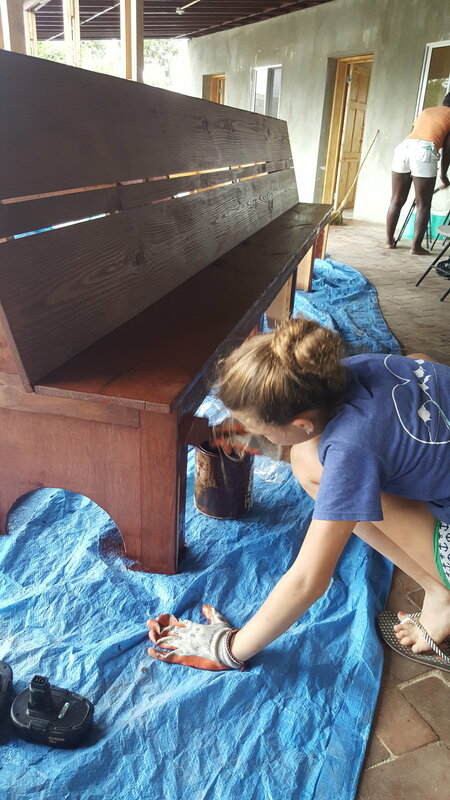 Jeremiah started in on building shelves and benches with Jos, and the girls got back to painting. The drive in each day was so beautiful. The roads are bumpy with lots of potholes - so the drive goes slower and you can take it all in. We laid a bed of sand along the top, hoping that the weight of the steel plate would rest on that, and give it room to expand. This woman cooked all of our lunches out on the land over small charcoal fires. They hope to hire her eventually at Strong Start, and I hope she eventually uses this griddle a lot! Tuesday was very full. In the morning, the girls and I got to take a tour with Amy of Second Mile while the babies were getting care in the nurses station. Amy explained more about how they determine whether a child has severe malnutrition. She introduced us to several moms, holding their babies. It is shocking to see 3 year old children - who look like they are only a year old, in their mother's arms because they are too weak to walk. 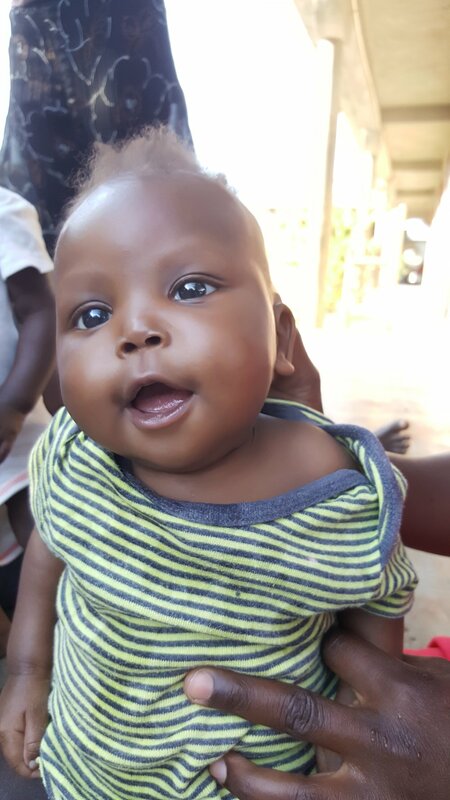 It was a beautiful thing to realize that these same smiling babies might not have a chance for survival without this opportunity that Second Mile is providing them. Part of Second Mile's program is that these children are given sachets of mamba - a nutrient enriched peanut butter which helps them to gain weight and get strong again. The mothers who are a part of the program learn new information daily about how to better care for their children. This knowledge goes far beyond just physical care. They are educated and supported in literacy, business training, as well as learning about how to grow food. After our time with the moms and babies, I took some dough to the newly finished griddle at Strong Start to test out a batch of sourdough muffins. We made a few egg sandwiches with them and decided it was going to work great! Why sourdough, you ask? The process of making sourdough requires a long, slow rise. During this process, the starter consumes the sugars in the flour and makes the bread easier to digest. The goal with these sandwiches, is to provide a nutrient dense and affordable meal to the pregnant moms at the maternity center. These sourdough muffins will also be made into meals at Second Mile for all the moms, babies and staff, once a week. Now that we knew the first griddle was a success, it was time to start the second griddle - this one at Second Mile. I went to work there with Joseph, Joslen and Wesely, while Jeremiah stayed at Strong Start and worked on building more benches. we passed many children walking to school each day. I wish I'd captured more pictures of them all in their matching uniforms. sweet girl - having a sachet of mamba. A nutrient enriched peanut butter packet to help her get well. Two moms who have met and become friends at the center. Both with 3 year olds. Cooking our first sourdough muffins on the griddle. Gia spending time with GiGi near the kitchen, and her two buddies - Pistache the kitty and Mamba the dog. Making progress on Griddle #2. Joseph and Wesley did ALL of the heavy lifting! Spending some time with these young moms and their little ones. Gia in her happy place. Goats, a kitty and a dog - all to herself! 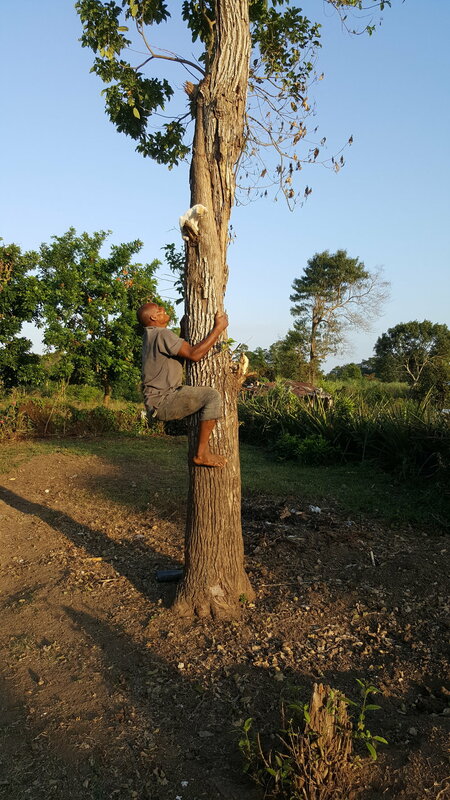 Pistache the kitty got stuck in a tree! But no worries - Wesley to the rescue! Our friend Wilson brought over hamburger patties. We used my muffins from the morning and had burgers on the new griddle! Wednesday morning we went exploring. Sitting atop the highest nearby mountain is the Citadelle. This historical wonder is a UNESCO world heritage site. It is one of the largest fortresses in the Americas, built over 14 years, completed in 1804 by the leader of the Haitian slave rebellion. Haiti was the first slave population to overthrow a colonial power. The Citadelle is about 5 miles up the mountain from the town of Milot below. Once we drove up to the top, we hiked another mile straight up. We were simply amazed by the history and beauty of this place! WHEW! this hike was steep! Excited about these ancient bread ovens! These bronze cannons are from Napoleon's ships! On their original hoists. Amazing! The rest of the afternoon I jumped back in on the griddle with the guys while Jeremiah worked on more benches at Strong Start. Amy and I stopped into the market for some flour so that we could test out the sourdough using locally sourced ingredients. Jenn and Amy treated us to dinner out in town, and I went home to mix up some dough with the Haitian ingredients. Thursday we spent a lot of time going back and forth between Strong Start and Second Mile. 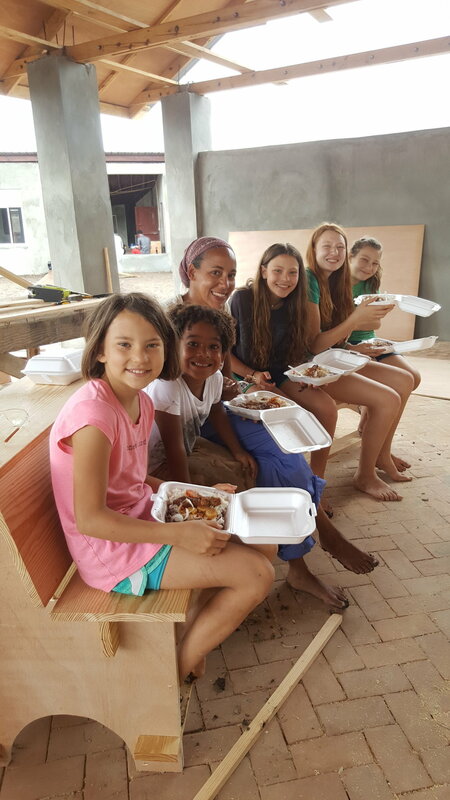 I tested out the new dough mixture from the flour we bought, We finished the second griddle at Second Mile and the girls helped Amy with organizing inventory supplies at the maternity center. 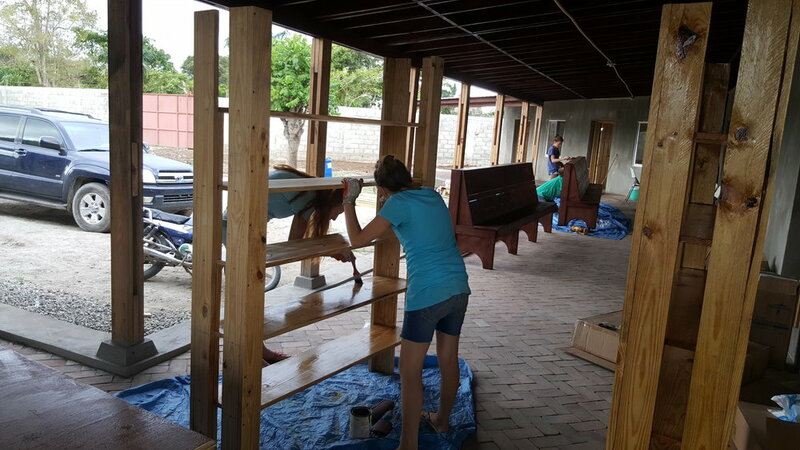 We varnished shelves, stained benches and Jeremiah kept building! The countdown was close to the Maternity center being able to open. They were getting things ready for the midwives to come for training. Thursday night it POURED rain. 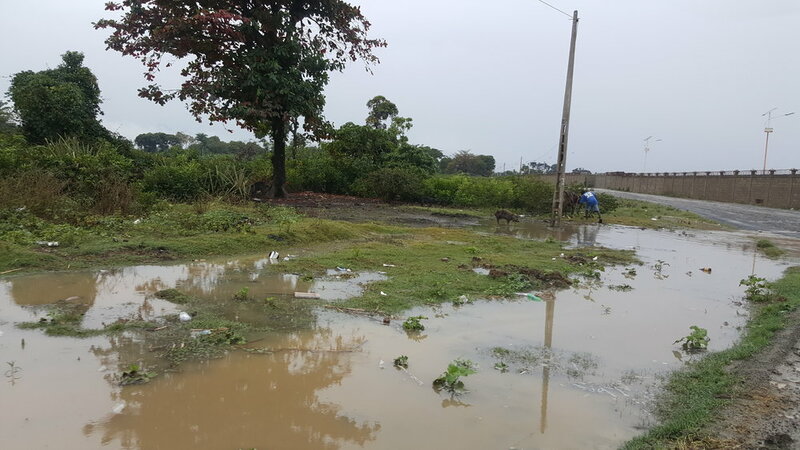 The roads were flooded in many places and mud was everywhere. 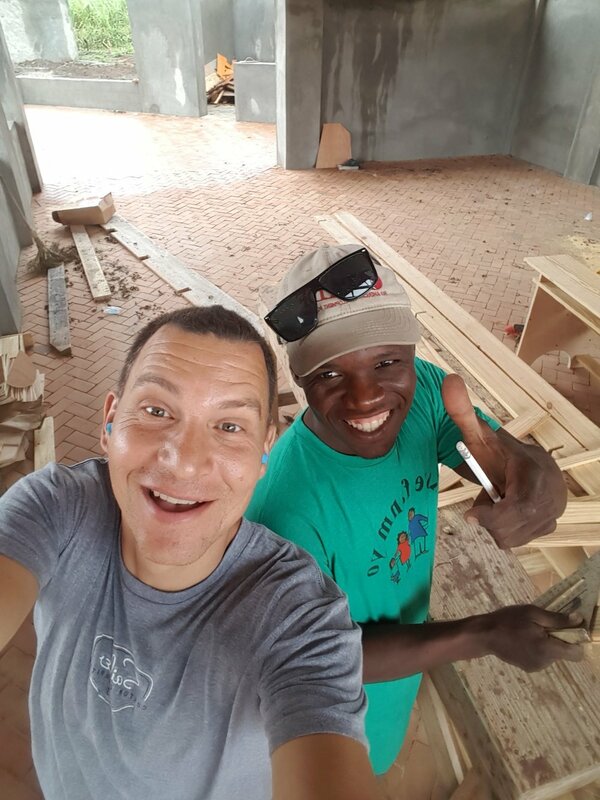 It took a long time to get to the land on Friday morning, but once there, Jeremiah finished up his last day of carpentry projects. Jenn arranged for a translator to be with me all day so that I could teach Blaise (SMH yogurt technician) how to make the sourdough muffins. Blaise was so focused and picked it right up. We also spent time with Wesley in the gardens, hearing an update on what they have growing and talked about how things could be improved. We walked barefoot to Strong Start to have lunch since the roads were too muddy to drive on. 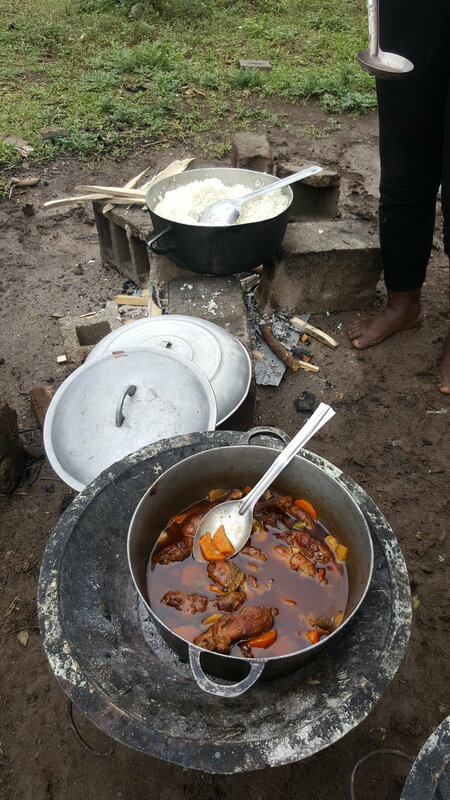 I was amazed at how the cooks made do with the muddy ground, cooking like they did each day. We cooked up egg sandwiches on the griddle with sauteed onions and tomato for some of the staff in the evening. It was a hit! It was our last day being out at the land, so we had to say our goodbyes to all of the employees which was really hard. My buddy Wesley starting the first fire. I'm so happy with how the second griddle turned out. Blaise taking over with the sourdough muffins. He's amazing. Last day at the land. We hope to return again soon! 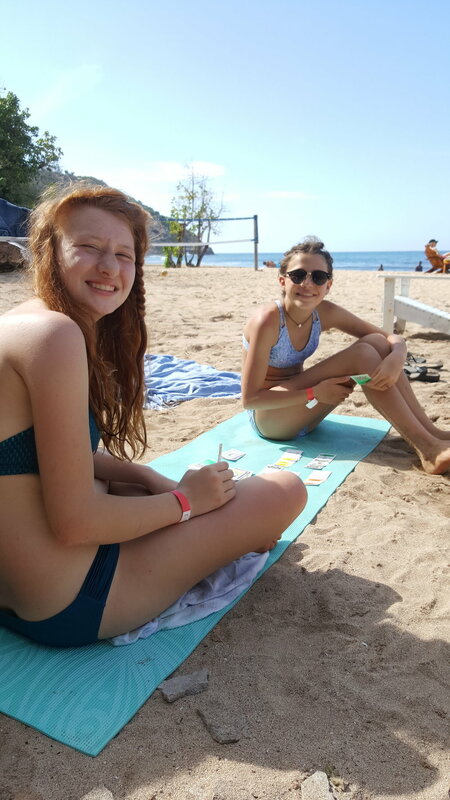 Our last day in Haiti we spent at Cormier beach. 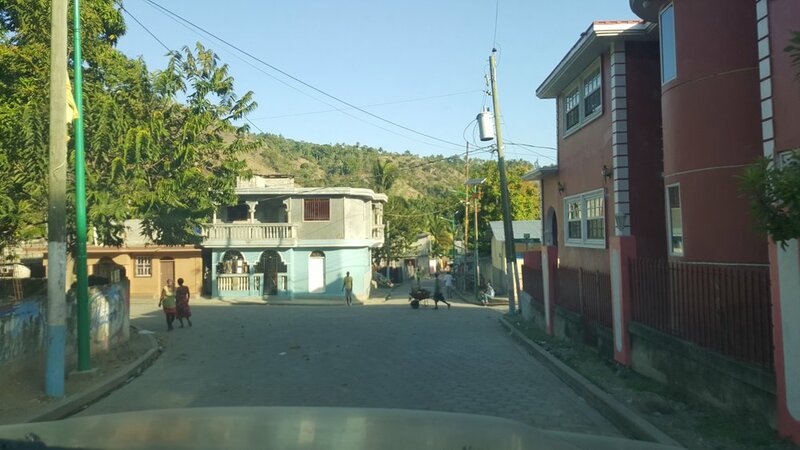 We enjoyed the gorgeous drive over the mountain again, and had a relaxing day seeing more of Haiti's beauty. Leaving for the airport was bittersweet. We had such an incredible 10 days. Thank you to everyone who helped get us there! Since we've been home, Blaise has already begun making sourdough muffins successfully, and they've fed the entire staff and moms and kids egg sandwiches. My heart is bursting!! I love discovering new places in the world. This Spring I had the chance to experience a beautiful new culture. Haiti is a lush island with beautiful mountains, clear ocean and beautiful people. 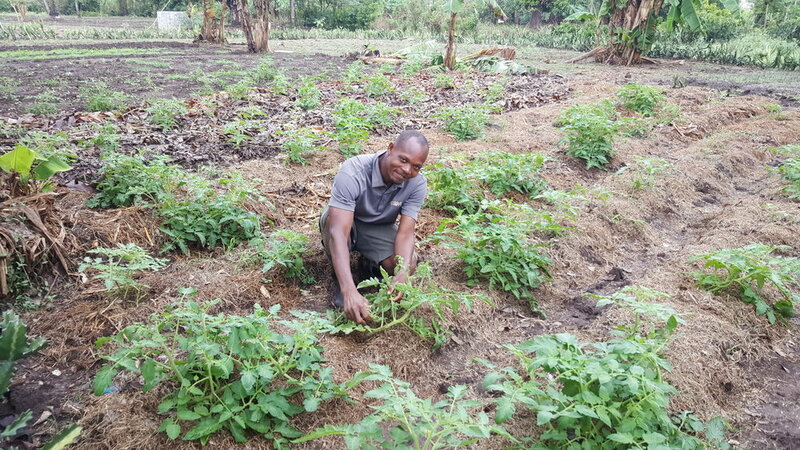 I've shared about this trip in a previous post that you can read, here, Here's the gist: my cousin Amy asked if I would come and help with the gardens at their land, a place they've started to support mothers of malnourished children. Amy and Jenn are two incredible young women who are empowering Mothers in Haiti through their organization - Second Mile Ministries. They focus on helping mothers who are at a dangerous point of not being able to care for their children. Because of poverty and illness, many women end up making the painful decision of giving their babies up to orphanages - in order to save their babies lives. In fact, most of Haiti's orphans are not actually orphans at all. They are babies who have mothers - mothers who want their children - but are completely desperate and have no options when their babies get sick or become malnourished. As a mother myself, the thought of being at that point (having to decide whether to stay with my child and watch them die, or give them to someone else) is unfathomable. The reality is, these are the decisions that many of the mothers in the world face. Amy and Jenn watched this happen first hand (as they'd worked in the orphanage setting previously) and became impassioned to do something about it. They had a dream of creating a place to help empower these mothers. With God's help and a LOT of hard work, they've created this place! At Second Mile Haiti, women are being given the chance to learn how to care & provide for their children. They are being offered hope. Not only are these babies getting the nourishing food and medical care that they need, the mothers are being taught how to keep their children healthy. 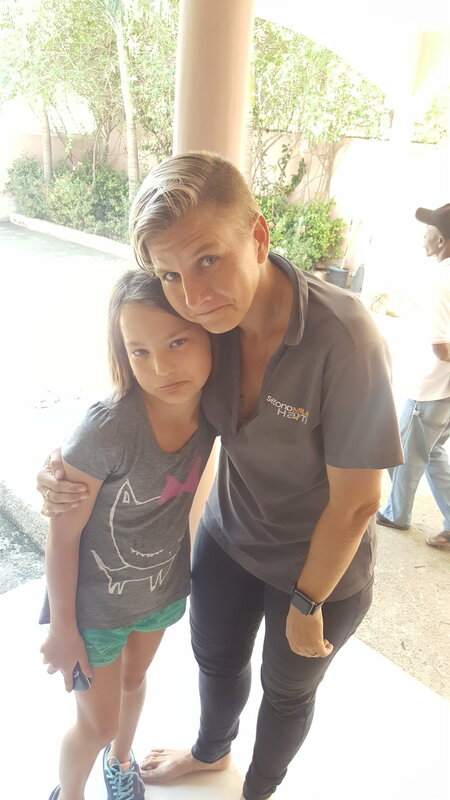 Amy & Jenn have hired other Haitians to teach them business skills, so that after the women go home - they will have the means to provide for their families in a new way. 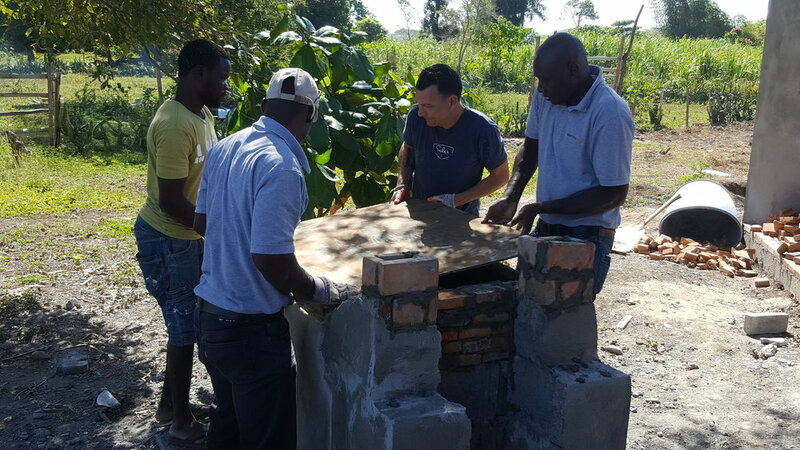 At Second Mile they are very committed to hiring local Haitians to run the organization. I was so amazed and inspired to see the way this is having an effect on the community. Not only are these Moms being touched - the workers hired to care for the land, the gardens, the clinic - are all being employed and are being empowered with new job skills and a livelihood. It was an incredible gift to be able to partner with them on the garden project - such a time of inspiration and fulfillment of personal dreams for me. I am eager to bring the whole family back to help some more! I've decided to start some kids sewing classes in my home again. I've taught sewing to young creatives in the past and I'm excited to do it again - this time to raise money to support a wonderful cause. Do you know any young creative kids who would love to learn to sew, or be taught creative gift ideas that they can make this year? Young budding seamstresses working away! Love spending time with these ladies! Each student will need to bring their own sewing machine and thread/notions, but all other materials will be provided. Send me an email at sarahksailer@gmail.com if your child is interested in joining and I will let you know how much space is available. My beautiful cousin (and nurse) Amy - doing what she loves. Ordinary World Changer. HAITI, here I come! My cousin Amy is a world changer. 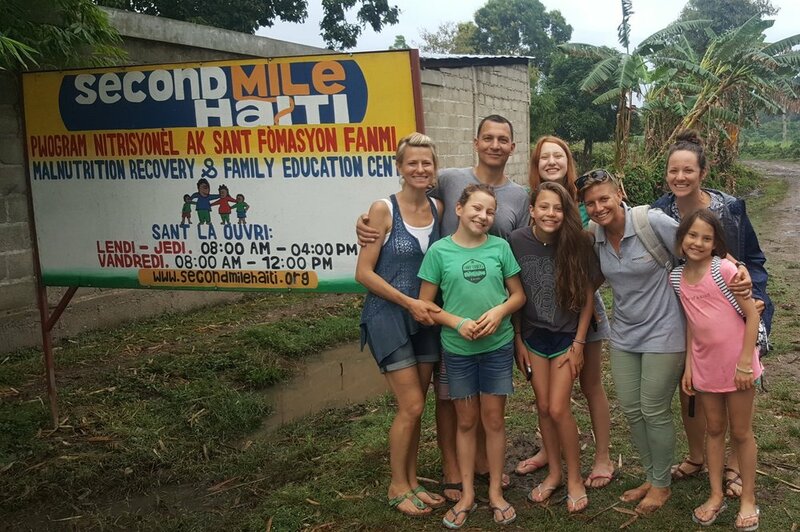 I have been watching from afar, as she and her amazing friend Jenn (both under 26) developed a passion for the people of Haiti - and have raised funds and started their own ministry: Second Mile Haiti - a home for malnourished children and their mothers. Amy is gentle, compassionate & a skilled nurse, and though I haven't met Jenn yet - I can tell that she is a visionary with awesome administrative & leadership skills. Jenn too, is a world changer. They seem to be a dynamic duo and the evidence is in the incredible progress they've already made. 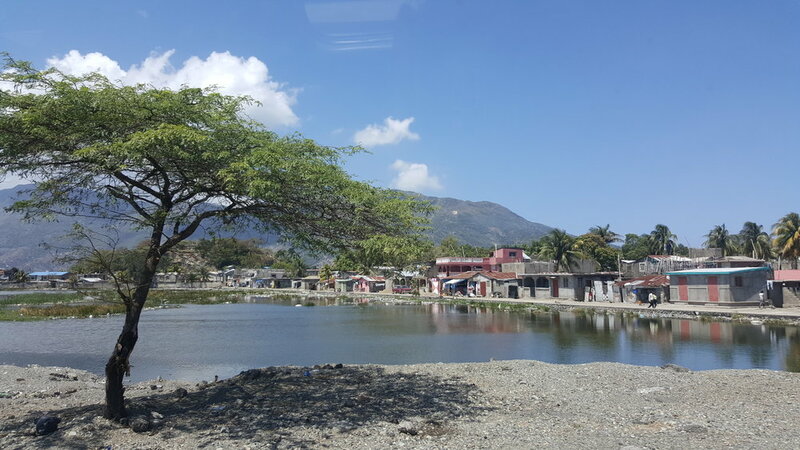 They have already purchased land in Cap Hatien, Haiti and have nearly completed finishing the buildings on the property: a clinic, education building, recovery homes, apartment - all within 17 months of solidifying their vision. AMAZING. When I say I've been watching from afar for the past few years of my cousin's life... I'll be honest - I've been watching with LONGING from afar. I had done shorter term trips to Brooklyn, NY & Mexico trips as a teen. I met my hubby just before leaving on a 6 month trip that included Korea and The Philippines. When Jeremiah and I were first married, we traveled together to Indonesia to stay with a friend. Back then, before having kids of our own - we felt a tug to involve our lives ( in some way/form) in overseas work. And later, it was a big part of our decision to homeschool. We've dreamed of raising our kids part of the year (somehow) in a developing country. We've wanted them to see that this American life we lead is not the norm for most of the world. We want them to be touched by the beauty of people in different cultures. With people who live with poverty and yet are full of joy. In moving to Colorado to buy a home and start our little family - we did not know what we were in for: years of intense job struggles, having FOUR daughters, starting and failing at a small retail business, deciding to homeschool, beginning a life of church-in-the-home-and-whole-of-life, struggling with health issues through diet & natural remedies. We've been in Colorado for 10 years now and it has been a ride. Those old dreams of travel and purpose faded to the background as we focused on surviving. Part of my spiritual journey has been my own struggle for significance. I lived with a deep fear that unless I tried very hard, my life might not matter. I was anxiously looking for ways in which I could make a BIG difference in the world. I didn't want my life to be 'ordinary'. I wanted to do something important with it. I felt frustrated that in my Mommy routine, my 'big dreams' of overseas impact seemed worlds away. Instead, I was living with small business debt - struggling to buy groceries, drowning in diapers and laundry and feeling like a failure in many ways. In the midst of all this, I was not alone. And my struggles were not for nothing. Our marriage was being strengthened through hardship, humbling circumstances and lessons in forgiveness. I was being taught how to be thrifty and resourceful with little. The financial and health struggles led to an unexpected love for gardening, I never knew I had. I've developed a deep love for my little neighborhood community here in Loveland. I do lead a very un-ordinary life! (I grow food, eat lots of fermented things, butcher my own meat, homeschool, and experience 'church' in the home)... this wasn't exactly what I had in mind... and yet it has opened up for me a life that I LOVE. I am a world changer, right here, today. I am an ordinary world changer with a God who specializes in making beautiful things out of hard things. I am God's beloved child. And so is everyone else. 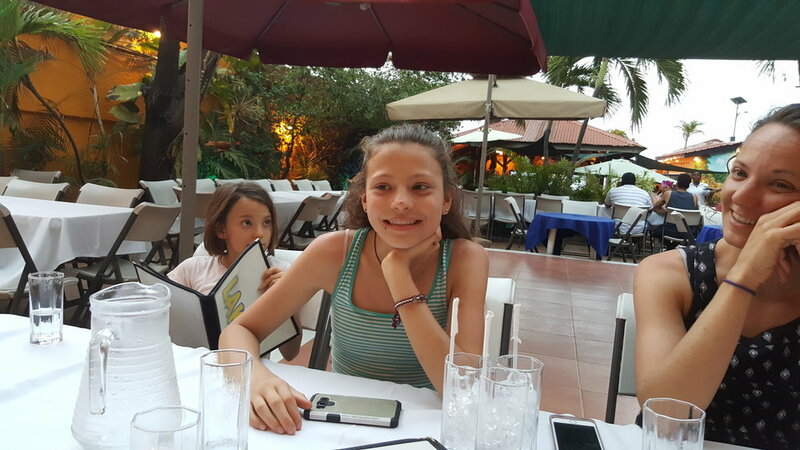 I'm changing the world as I raise my daughters, love my neighbors, show up for my friends and continue to keep my eyes open for opportunities where my passions and gifts can be spent on the needs of the world. Last month... Amy emailed me. She told me that they (the Haiti world-changers) had been reading my blog. She said they were inspired and wondered if I would want to come out and help them with food gardening/homesteading ideas for the land there. I thought of those dreams of overseas travel (pushed down deep, the ones I had named unrealistic & unattainable). The financial battles and handfuls of daughters and piles of laundry and unorganized drawers and mountains of dishes had not completely buried them. Uncovering those old dreams beneath these 10 years of life... they look different. Maybe because I am different. So I'm heading to Haiti in a little over a week! I'm going by myself for 10 days - (to soak it all up, help with what I can, make plans, share ideas). I'm also stopping in Florida at ECHO to view and learn from their tropical education food gardens. (excited squeal) I have SO much I hope to learn. Second Mile will be housing 12 mother and (malnourished) child pairs at a time at the recovery homes on their property. They will be teaching the women job skills, health care knowledge (to care for their own babies). They want to have a large food garden with animals to supply as much of their own food needs as possible, as well as sample small home gardens for the women to learn creative ways to grow their own food and become as self-sufficient as possible. I hope to help by getting my hands dirty, jump-starting ideas on composting & soil prep, roof-top gardening, gardening in small spaces, vertical-trellising, small livestock production and how it works into the garden. Once I get home, we will continue to pray and plan for more trips with the family - however the need & opportunity arises. I want to return with my other half (who is the practical skill behind my dreams) and our girls at some point. This is a new adventure for us - but SUCH a fitting one. They have been busy raising funds for buildings, solar electricity, medical supplies and it's been amazing to see funds come in. 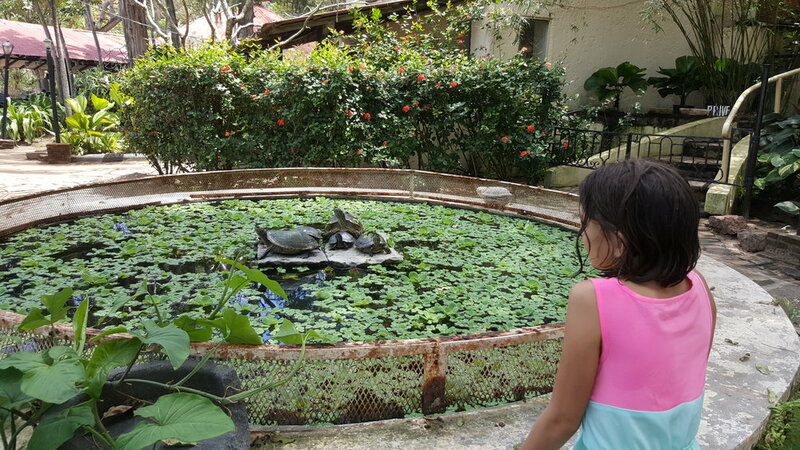 They are currently low on funds for their food gardens and it would be amazing if we could raise some extra money so that we might get started on some projects while I am there. If you would like to be a part of this, please click here. Click on DONATE NOW and add in the comments that you want to donate to the food gardens. So simple!! We also have big dreams for our own homestead in Loveland. 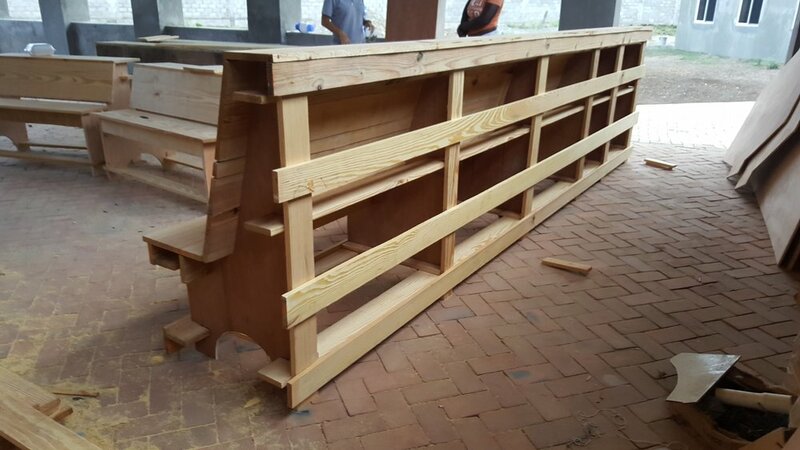 We will be partnering with an incredible friend and gifted neighbor to add a wood-fired bread oven to our property. 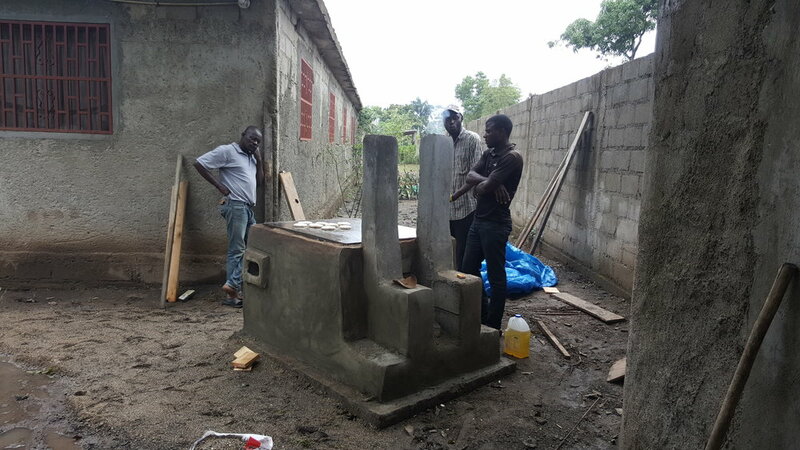 We hope to add rain water barrels and a Tilapia pond in the near future. Our vision for our home is that it would be a helpful place and inspiration for our local community as a learning garden, sustainability center and resource. I have dreams of teaching classes at my home on composting, soil management, food preservation and cooking someday. 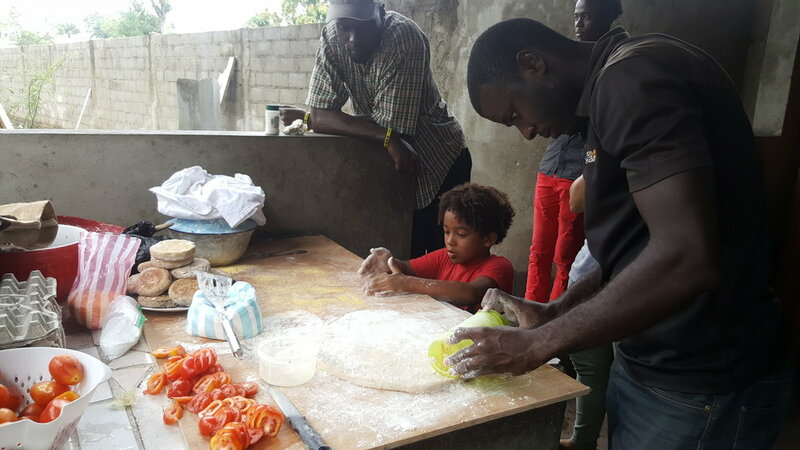 Now that we are beginning this adventure in Haiti - I can see how our experiments in sustainability may be a wonderful asset to share with them as well. We each have our own unique passions and skills to share with the world. We are all ordinary world changers! Thanks for being a part of my journey and for doing your part to offer yourself to the world in your own beautiful way!